The effects of Hurricane Harvey have shown up in a number of data series, but the underlying trends are intact. 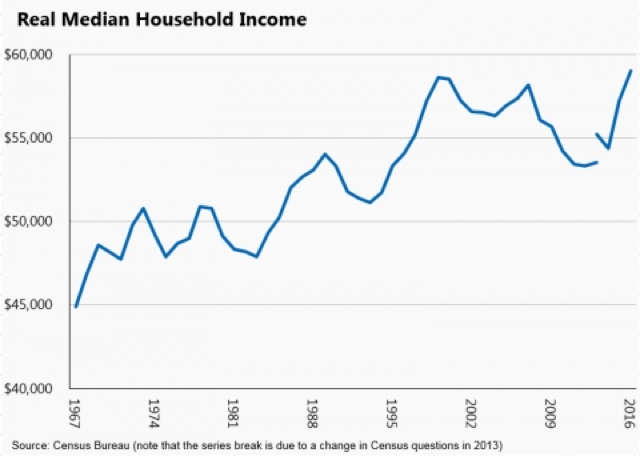 2.5 cheers for 2016's new high in real median household income! Given that I consider jobs and wages for average Americans my #1 focus, it's only fair that I write about this week's release of the real median household income for 2016, don't you think? it is NOT a measure of real wages. 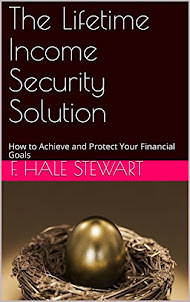 It includes all income -- things like pensions, dividends, and social security. it includes ALL households, not just those headed by workers. A household of full time students is included. Your 85 year old grandparents are included. A household where one or more persons is unemployed is included. A household where one spouse stays home to raise the children is included. Another problem with the metric is that it is only reported once a year, and with a nine month delay to boot. So this week's data release tells us what household income was for the period of 9 to 21 months ago! Not exactly timely. Fortunately, there are several ways to get more timely data. First of all, a decent back of the envelope estimate can be made by taking average hourly wages, which are reported monthly, multiplying by the number of hours worked, also indexed monthly, and dividing that by the entire population age 16 and over. It's an average, rather than a median, and it won't give you an exact number but will give you the overall trend. Even better, Sentier services calculates an estimate of actual median household income monthly based on the Household Survey reported each month by the Census Bureau (that's the report that gives us, e.g., the unemployment rate). Doug Short has done excellent work putting this in graphic form each month. Back before the big decline in gas prices had the result of driving real, inflation-adjusted wages to new highs, I would constantly read how real median household income showed that wages were actually declining. That was hogwash. Now that real wages are at new multi-decade highs, there's a whole new round of hogwash! But, enough background. Let's turn to the actual numbers. That is unadulterated good news. The average number for the 12 months of 2016 was higher than any previous year. This is the second year in a row that the very timely monthly reports by Sentier showed strong increases in real median household income, and were later confirmed by the official numbers. In other words, Sentier has a very trustworthy record and you should be paying attention if you care about this metric. The bottom two quintiles have still not made up all of the ground lost since 2000, although the top 50%-60% have. On the contrary, the very top 10% have been doing extremely well (which has led to some earth-shaking political consequences on both the left and right). Another legitimate caveat is that the Census Bureau changed its methodology 3 years ago, and regrettably has not published its results for both methodologies in order to create a baseline correlation for future use. We know that three years ago, the change in methodology made the number *for that year* about 3.2% higher. Hence the break in the lines at that time period. Is there a similar issue with regard to this year? Nobody knows for sure. But, yes, because of this we do have to put an asterisk next to the claim that 2016 was a new all-time high. 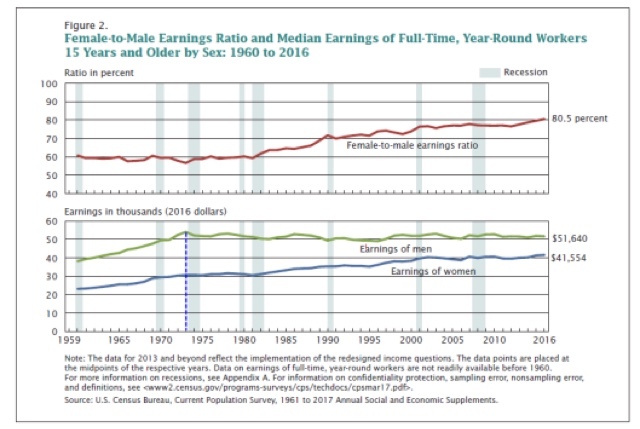 All of the peaks since then, including the new peak for 2016, are in part because women entered the workforce, and thus the income of households where both spouses work has gotten higher. But of course this is a real tradeoff if one of the spouses would prefer to stay home and raise the kids, but feels they have to work to make ends meet. It is also perfectly fair to point out that the new highs in income last year don't do anything to erase the many years of lesser income in particular since the beginning of the Great Recession. 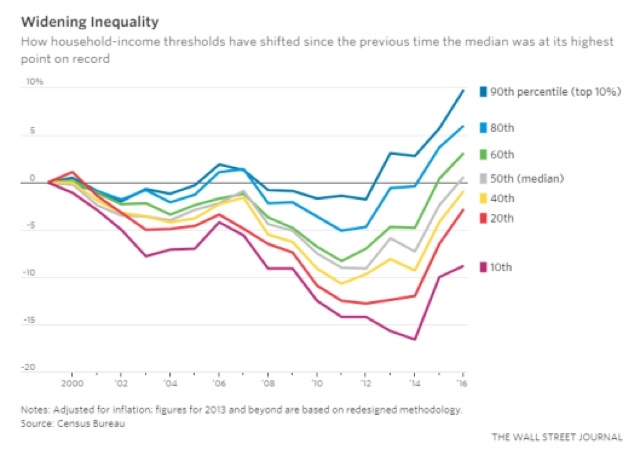 This means that median household *wealth* is still below what it would have been had we been at or near full employment for all of those years. In other words, the long-term well being of the median American household is still compromised. 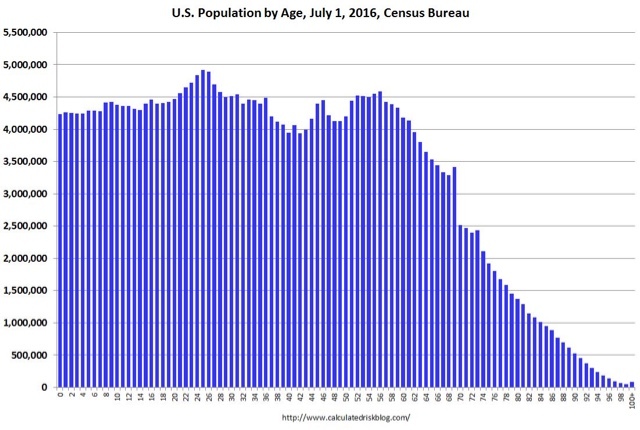 [T]he Census Bureau data show that the bulk of the gains in real income in 2016 was explained by one factor: higher employment. In other words, hours worked rose but wages did not. The members of American median households are working harder at more jobs to finally get an increase in incomes. 1. real median household income mainly rose because of more employment. 2. that means hours worked rose. 3. that means people were working more hours. 4. that means that household income really only increased because people had to work more hours for the same hourly pay. 3. that means that aggregate hours increased, due to unemployed people finding work, part-timers getting more hours, and some part-timers getting full-time employment. Oh, that's a little different. 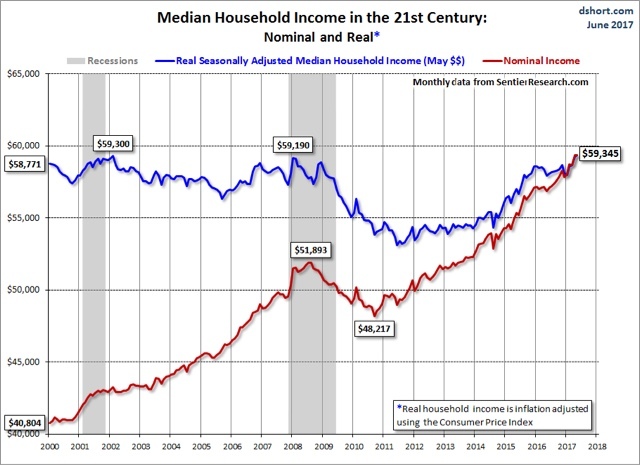 The bottom line is: 2.5 cheers for the new high in real median household income for 2016. That a majority of US households are earning more than that group ever did before is great news. But, as evidenced by the last 15 years of this statistic, it by no means erases the long-term decline in the health of what used to be called the American middle class. Last week I promised I would repeat an exercise I first undertook in 2012 when Superstorm Sandy disrupted the initial claims data: estimating what the initial jobless claims would have been, but for the hurricane. What that does is give me the number if the affected states had the same relative number of claims during the given week, as all of the unaffected states. In 2012, it showed that Sandy was not masking any underlying weakness in the economy. The state by state data is released with a one week delay. So what follows is the analysis for the week of September 2, the number for which was reported one week ago. This week I only had to back out Texas. Next week I will undoubtedly have to back out Florida as well. If we use the 2016 weekly seasonal adjustment of 1.18% for the adjusted 201,405 total, this gives us ~238,000. If we use the 2017 weekly seasonal adjustment of 1.19% for the adjusted 201,405 total, this gives us ~240,000. Thus the hurricane-adjusted initial jobless claims number for the week of September 2, 2017 is 239,000. But openings are the one aspect of the report that are not "nard" data. They can just as easily be skewed by employers trolling for resumes, perhaps laying the groundwork for visas for cheap immigrant labor, or simply refusing to offer the wage or salary that would call forth enough actual applicants to hire. Thus I prefer to focus on the "hard" data series such as hires, quits, and layoff, where the story hasn't been nearly so strong. In the last three months, hires have picked up somewhat - although not to new hiighs, unlike separations, which *are* at new highs. The recent surge in layofs and discharges is actually similar in scale to that just before the last recession. JOLTS shows an employment situation that, while still positive, is slowly decaying. What is the problem with the housing market? Is it unaffordable house prices? Rents? Maybe both! Which leaves only one other alternative. Last week the Chicago Fed announced backdated revisions to its Adjusted Financial Conditions Index. Since this changes their interpretation somewhat, I wanted to flesh this out. The Chicago Fed has a "Financial Conditions Index" which is self-explanatory, as well as several sub-indexes, one of which, the "leverage" subindex, it has identified as leading. It also has an "Adjusted Financial Conditions Index," which is supposed to calibrate how loose or tight credit conditions are *relative to* background economic conditions --i.e., are financial conditions more or less tight than they have typically been given the data background. Because the Adjusted Index appeared to track, and somewhat lead, the Senior Loan Officers Survey, and because it is reported weekly rather than quarterly, I report this Index every weekend. With that modification (i.e., adding +0.5 to the Adjusted Index as the line between "loose" and "tight" credit conditions, I will continue to track it weekly as a long leading indicator of promise.